Music has this unique ability to bring together people in a series of unforgettable moments throughout one’s life. One of those moments came at last year’s 45th Annual CMA Awards, when country hit makers Brad Paisley, Keith Urban and Vince Gill took to the stage to perform some of Glen Campbell’s unforgettable hits. In the audience sat the humbled and legendary Glen Campbell….singing each and every word. Oh…the cruelty of Alzheimer’s disease. Just this past June, Glen and his wife Kimberley announced to the world that, after dealing with short term memory loss for a number of years, he had been officially diagnosed with the devastating disease. Yet, rather than crawling into the darkness, Campbell has focused on remaining one of country music’s most legendary figures. Named both CMA Entertainer and Male Vocalist of the Year in 1968 and inducted into the Country Music Hall of Fame in 2005, Campbell’s recent album release Ghost On the Canvas has received widespread and much deserved acclaim from the entire music industry. Not only does the album feature an unforgettable line up of songs and lyrics, it also includes Campbell’s recognizable guitar licks with some of music’s finest, including Billy Corgan, Brian Setzer, Rick Nielsen, Jason Falkner, Marty Rifkin, Steve Hunter, Tim Pierce and Keith Urban. 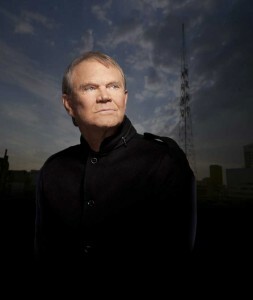 The eight-time GRAMMY® winner also finds himself in the midst of a final slate of live performances dubbed “The Glen Campbell Goodbye Tour, including this week’s appearances at the Rialto Square Theatre in Joliet. And if that wasn’t enough, it was recently announced that Campbell will receive a Lifetime Achievement Award at next month’s 54th Annual GRAMMY awards. Indeed, Campbell’s 75 years of history…from his modest upbringing in Arkansas to his unsurpassed stardom in music, television and movies….is worthy of an unforgettable sendoff. Yet, for some reason, no one seems ready to say goodbye quite yet.